Leicester Tigers kept up the pressure on the Premiership's top two with a bonus-point victory against bottom club Sale Sharks at Welford Road. 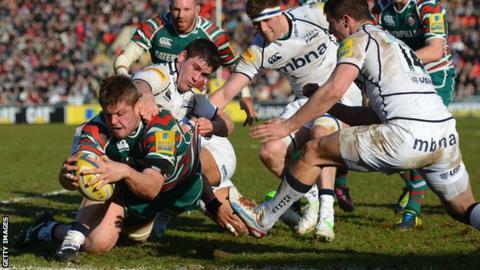 Two scores from lock forward Ed Slater and a penalty try helped Leicester to a 27-3 lead at half time. Matt Smith (2) and Mathew Tait added further scores as the hosts cemented third place in the table. George Ford kicked 18 points in a faultless display, while Andy Powell scored a consolation try for Sale. The Sharks, who eight days earlier, were unable to make any sort of impact and they remain three points adrift of second-bottom London Welsh at the foot of the table. Back-row forward Tom Croft, named captain on his 100th start for Leicester, made inroads immediately from the kick- off, earning the Tigers a penalty which Ford easily slotted through the posts. The Tigers were making light of the absence of six of their England internationals and their early dominance was nearly rewarded with a try, but Thomas Waldrom's score was ruled out as prop Logovi'i Mulipola had knocked the ball on as he made for the line earlier in the move. Failure to take their opportunities was becoming a common theme for Richard Cockerill's side before Sale's defence was finally breached by lock forward Slater. Sale Sharks suffered their heaviest Premiership defeat of the season at Welford Road, eclipsing their 43-6 loss at Exeter on the opening day of the season. Ford and Nick Macleod swapped penalties before the floodgates opened, as the Premiership's bottom club conceded two tries and lost Tom Brady to the sin-bin on the stroke of half-time. First, Leicester winger Adam Thompstone was prevented from latching onto Dan Bowden's grubber kick by Sale's Brady, who saw yellow shortly after referee Wayne Barnes had signalled a penalty try for the hosts. Then Slater crossed for his second score of the afternoon, showing a superb turn of pace to touch down. Leicester secured the bonus point with the first of Smith's two tries early in the second half and former England man Tait later ran in unopposed, but the home side were unable to break the 50-point mark for the first time in a competitive match this season. Sale had the final say when Wales international Powell touched down following a spell of forward pressure, but they were well beaten. "It was a really good performance. Sale have got some issues but I thought the attitude of the players was outstanding. "I was a bit surprised how easy it was to play against Sale, I thought they would be better. But I'm delighted, we needed to win and with the Quins result (losing to Exeter) it puts us back in the melting pot for the top two again. "We have come out of this (international) period with 11 points from four games, which is not brilliant, but with some of the things that have gone against us we are still in the mix with guys to come back." "We are really disappointed with the performance. We came here with what we thought was a competitive side and were drilled. "I don't know why. Sometimes it happens. We have to look at ourselves and regroup. We have to win two or three games and put in better performances than today, otherwise our position will be justified. "We have been in the Premiership since it began and we want that to continue. We will fight tooth and nail." Leicester: Tait; Morris, Smith, Bowden, Thompstone; Ford, Harrison; Ayerza, Hawkins, Mulipola; Slater, Kitchener; Croft, Salvi, Waldrom. Sale: Shepherd; Brady, Leota, Tuitupou, Jennings; MacLeod, Willis; Harrison, Jones, Thomas; Gaskell, McKenzie; Braid, Seymour, Vernon. Replacements: Davies for Tuitupou (60), Cipriani for MacLeod (50), Fowles for Willis (50), Cobilas for Harrison (58), Taylor for Jones (50), Buckley for Thomas (58), Gray for McKenzie (45), Powell for Vernon (45).